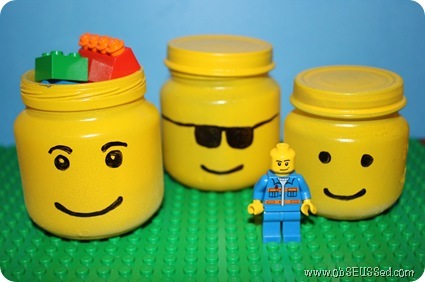 These old baby food jars turned lego head containers from ObSEUSSed are a handy place to keep small lego pieces from getting lost in the mix or a super fun party favor (just fill with candy). You can check out this DIY Lego Storage ideas HERE. Thanks so much for featuring my craft! Also Congrats at reaching 4000 GFC followers. You have an awesome blog!